WITH ALL the eloquence of weariness, the aged musicians calling themselves the Buena Vista Social Club seem to embody the spirit of their home city of Havana, Cuba. Today Havana is a decaying city of pastel palaces, decorated with laundry hanging on rusty but still ornate iron scroll work. Bulgemobiles from the 1950s, gorgeous in their dotage, roll through the narrow streets. In Wim Wenders' new documentary, Buena Vista Social Club, we glide past other sights: a hotel named Karl Ma-x (the "r" gone missing) and the last communiqués of the revolution painted on the walls of crumbling buildings. Even a picture of Che Guevera we see as we glide past looks like the revolutionary had a very bad night. The city, Wenders has said, is sadder than Venice. The thought that the U.S. embargo will no doubt end soon--that same embargo that's helped keep the city broke and peeling--doesn't improve the picture. Who can be cheered up by the thought that this dreamy hothouse city, this Caribbean Alexandria, may end all Starbucked up? Wenders hasn't been so stimulated by sadness and decay since he toured Berlin in Wings of Desire. Wenders' former collaborator Ry Cooder (who did the soundtrack for Wenders' Paris, Texas) went to Havana to record some of the old but still-living great names of Cuban popular music. 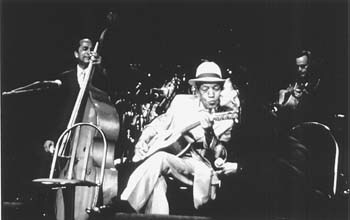 Cooder's sessions became the 1997 album Buena Vista Social Club (Nonesuch), which was a surprise Grammy-winning hit. In this documentary of the same name, Wenders follows Cooder to Cuba to interview the elderly performers as they gather for a two-stop tour in Amsterdam and Carnegie Hall. The leadoff song on the album,"Chan Chan," is the one that best sums up the lives of old men at sunset. "Chan Chan" is the first song in Wenders' film, too, performed live in Amsterdam. Wenders leads into the number with footage of the song's composer and singer, Francisco "Company Segundo" Repilado, trying to find the location of the original Buena Vista Social Club, a long-closed nightclub in east Havana. "Chan Chan" is a tune in which the singer, traveling a long road by foot, remembers the swaying walk of a woman he once saw years and years ago. "Clear the path of dry cane leaves because I want to sit down" go the lyrics. If the song is about the weariness of age, it's not lifeless; the miracle of these Cuban performers isn't how old they are but how well and strong they sound. Wenders loves the romance of the performers' having defied time. This romance is seen especially in the duet Ibrahim Ferrer (over 70) and the group's only woman, Omara Portuondo (of uncertain age), singing "Viente Años," a song of dead love, in a duet. They face each other over the microphones, circled by Wenders' Steadicam, like Hitchcock's camera embracing Gary Grant and Ingrid Bergman in Notorious. THIS IS Wenders' best work in a long time. Here Wenders has a strong story, is inspired by the surroundings and doesn't revel in the despair. The pictorial value of the film is limited, due to the cost-cutting measure of filming on digital camera. Sometimes, especially in the scenes of the band visiting New York, the film indulges in some unnecessarily heavy irony. We see the visiting musicians marveling over the skyscrapers, when Manhattan isn't nearly as picturesque as Havana, or trying to name the different souvenir statues of celebrities, Marilyn Monroe, Louis Armstrong, displayed in a novelty-shop window. The Cubans don't recognize a statue of Cuba's invader, JFK, when they see him. Still, Wenders' choices are stronger elsewhere. At one moment he fades expertly from a studio to a live stage; in another, he merges nearly colorless seawater under fog with the lights of Los Angeles as Cooder and company fly home on a nearly empty jet. It's worth seeing Buena Vista Social Club if only to catch up on a secret of old age, voiced by Ferrer. The old man is speaking of Cuba, speaking of musicians and speaking for himself: "If we'd followed the way of possessions, we would have been lost long ago. ... We've learned to resist both the good and the bad." Buena Vista Social Club (Unrated; 101 min. ), a documentary by Wim Wenders, photographed by Jörg Widmer and starring Ibrahim Ferrer, Amadito Valdés, Eliades Ochoa and Ry Cooder. From the June 3-9, 1999 issue of Metro, Silicon Valley's Weekly Newspaper.